Put your talents and resources to work for you. Start your own tutoring business. It's fun and rewarding, and no degree is needed. Please visit our new Prayer Request Page. We hope you are enjoying the holiday weekend. The Lord is my light and my salvation; whom shall I fear? The Lord is the defense of my life; whom shall I dread? When evildoers came upon me to devour my flesh, my adversaries and my enemies, they stumbled and fell. Though a host encamp against me, my heart will not fear; though war arise against me, in spite of this I shall be confident. One thing I have asked from the Lord, that I shall seek: that I may dwell in the house of the Lord all the days of my life, to behold the beauty of the Lord, and to meditate in His temple. For in the day of trouble He will conceal me in His tabernacle; in the secret place of His tent He will hide me; he will lift me up on a rock. And now my head will be lifted up above my enemies around me; and I will offer in His tent sacrifices with shouts of joy; I will sing, yes, I will sing praises to the Lord. Hear, O Lord, when I cry with my voice, and be gracious to me and answer me. When Thou didst say, "Seek My face," my heart said to Thee, Thy face, O Lord, I shall seek." Do not hide Thy face from me, do not turn Thy servant away in anger; Thou hast been my help; do not abandon me nor forsake me, O God of my salvation! For my father and my mother have forsaken me, but the Lord will take me up. Teach me Thy way, O Lord, and lead me in a level path, because of my foes. Do not deliver me over to the desire of my adversaries; for false witnesses have risen against me, and such as breathe out violence. I would have despaired unless I had believed that I would see the goodness of the Lord in the land of the living. Wait for the Lord; be strong, and let your heart take courage; yes, wait for the Lord. Behold, the eye of the Lord is on those who fear Him, on those who hope for His lovingkindness, to deliver their soul from death, and to keep them alive in famine. Our soul waits for the Lord; He is our help and our shield. For our heart rejoices in Him, because we trust in His holy name. Let Thy lovingkindness, O Lord, be upon us, according as we have hoped in Thee. May Thy lovingkindnesses also come to me, O Lord, Thy salvation according to Thy word; so I shall have an answer for him who reproaches me, for I trust in Thy word. And do not take the word of truth utterly out of my mouth, for I wait for Thine ordinances. So I will keep Thy law continually, forever and ever. "TRUSTING GOD'S FAITHFULNESS DISPELS OUR FEARFULNESS." This quote is from Our Daily Bread - February, 2003 Issue. If you've printed this pattern please print a new copy. Also known as Tunisian crochet. Special hooks are used that are much longer than ordinary hooks to make room for the large number of stitches. It is very important to check the number of stitches on the hook at the end of each row from right to left, because it is very easy to skip the last stitch at the end of the row. NOTE: The right side of the work is always facing you. Step 1: Make a base chain with the required number of stitches (no extra turning chain). Insert hook in 2nd ch from hk and draw through a lp. Leave this lp on the hook. Pull a lp through each ch, leaving them on the hk, to the end of the row. Step 3: Do not turn the work. Work from right to left. Skip the first vertical lp formed at the edge of the work in previous row. Insert hk from right to left behind the next vertical lp. Yo and draw yarn through the vertical lp. Leave this lp on hook. Continue in this way to end. make sure you do not sk the last vertical lp on left-handed side of work. Repeat Steps 2 & 3 till project is desired length. yarn. This helps me know how much yarn to purchase for my next afghan. 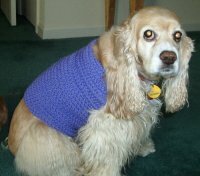 Here is a picture of my American Cocker Spaniel, Piper in the sweater I made from your pattern. This is the first one I've made so far. I hope that the others turn out better. I'm in the process of making one for my boy Cocker, Bodie and I will email that picture to you. Thank you for your wonderful pattern. These are SO easy and quick to make. Here is a picture of Bodie in his. I didn't see any error, but you might want to instruct people with male dogs to go a little shorter on the body than on females. 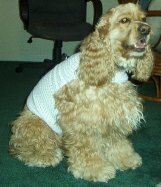 Here's my dog Samson in his sweater. Thank you for this great web site. I really enjoy it. But didn't find it difficult especially since he was available to try it on while I was making it. He actually gets all exited when he sees us coming to put it on him. So I made him 2 and am now making 2 for my friends boxers. I also had to make back leg holes to hold the back down, otherwise it stuck up like he was wearing a cape. All I did was make a chain and then crodhet a row of sc back over it. I put the chain on the "corners"of the back at the back legs. When I get some pictures of the boxers with their coats I will send you pictures. I just love the variety! Especially the Bible trivia. So refreshing! 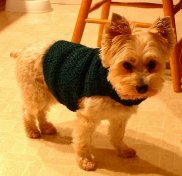 I sent you an email several months ago telling you about the great success I had crocheting a sweater for my Jack Russell, Link. Well, I FINALLY got around to getting some digital photos taken to send in. In the meantime, I made a second sweater so now he has two to show off in both Safety Orange and Blue Stripes. Thanks again for this great pattern! It is a nice surprise to see you speaking out for our God. I love the message at the end. And appreciate that you are not ashamed of the gospel of Christ. Great site. Thank you. Blessings in Jesus name! ! ! opportunity to tell her class about patriotism. "We live in a great country," she said. One little boy came walking up to her from the back of the room. He stood with his hands on his hips and said, . . .
"I'm not free. I'm four." Her 4-year-old son overheard some of her parents' private conversations. little boy if he was excited about the new baby. An irritated father complained to his golf buddy. computer game and CD player in his room!" "So how do you handle it?" his friend asked. suddenly saw flashing lights in my rearview mirror. was rushing home to be with my wife on our first anniversary. "Congratulations. The first year is paper, right?" It was Judi's first plane trip. would have some fun with him. made a big fanfare as the badge was presented. but you know your people better than I do." A friend of mine is a deputy with the sheriff's department canine unit. his patrol car and commanded it to enter and seek. little Johnny received his plate, he started eating right away. "Johnny, wait until we say our prayer," his mother reminded him. "I don't have to," the little boy replied. she knows how to cook!"